Borer is most commonly found in older homes. Why? Because they prefer untreated timbers. They are also quite fussy. Would it surprise you to know that some borer species favour rimu whilst others prefer pine, and others like the softer woods. Of the New Zealand species the common house borer (Anobium punctatum) prefers pine and is the most the number one pest of decorative wood such as window and door jams or skirting boards. Borer can structurally weaken timber, and long-term may begin to threaten the integrity of the supporting timbers within a building. Attacks by two-toothed longhorn beetles (Ambeodontus tristus) our second most common borer in the region are more likely to start in subfloors, especially where it is damp. Reducing populations can be as simple as improving ventilation and drying the area out. But that’s not all. It is equally important to apply a treatment that kills the adults, interupting their life cycle. Recommended treatment involves a residual surface application that will last longer than the life cycle of the borer. DIY Borer bomb treatments will have little impact on an infestation. Reason is the treatment is unable to penetrate the timbers where the burrowing larvae are most active. Of cause, the bomb may kill a few adults but to permanently get rid of borer a control regime, administered by a pest control professional is best. If your whole home needs to be treated, despite much of the wood in your home being unreachable, we will utilise a combination of applications. Starting with an initial treatment, Nature’s Way will recommend ongoing borer monitoring and management. 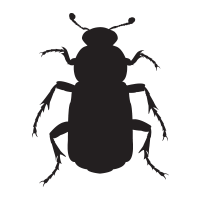 Costs of treatments will vary depending on the borer species being targeted, the size of area to be treated, the levels of infestation and the ease of access to the infested timbers. If you have a borer problem contact us at Nature’s Way Pest Control.